Money is a very obscure and almost supernatural topic for most people. Hardly anyone actually takes the time to understand how the monetary system actually works, how new money is created, and what role the Government actually plays in this process. If you don't know much about these things you will be absolutely stunned when you first learn how it all actually works. To start with we need to understand how the current debt-based money system works and how it is rigged in all ways possible. The least of our problems is related to the fact we use fiat money. The short video below explains some important things you should be aware of. To sum it up rather quickly, most of the money in our economy actually represents a debt to the banks. What essentially happens is that banks loan out money which they do not have. Via the magic of fractional reserve banking they can loan out nine times as much money as they actually have in their reserves. When you get a loan the banks don't actually take it from other accounts, so new money is created in the process. In other words: the more debt that exists, the more money that exists. Since most people often re-deposit any money they loan from a bank, back into a bank account, the effect multiplies. The bank can use that deposit as a basis for a new loan, and they can loan out more money based on money which was created in the same way. Through this process extremely small amounts of money can be transformed into large amounts of money which comes from nothing and also demands an interest fee. The interest, by the way, is never actually created. Not only are you "paying back" money the banks never had, you're paying interest on top. Debtors must collect that extra interest from the existing money supply, most of which is also based on debt which generates interest. This self-perpetuated loop of debt means that more and more money is needed in the money supply to service the ever growing debts. As such, the central bank is forced to constantly issue more and more money in order to ensure the system doesn't collapse. Any logical person would conclude at this point, such a system can simply not be maintained forever. From a purely analytical perspective the system is doomed to fail. "Banking was conceived in iniquity and was born in sin. The bankers own the earth. Take it away from them, but leave them the power to create money, and with the flick of the pen they will create enough deposits to buy it back again. However, take away from them the power to create money and all the great fortunes like mine will disappear and they ought to disappear, for this would be a happier and better world to live in. But, if you wish to remain the slaves of bankers and pay the cost of your own slavery, let them continue to create money." If you ignore the imaginary money created by banks when they issue bank credit, we also have new money created by the Federal Reserve. The process isn't really much different. They either print some pretty looking paper or change some numbers on a computer, and viola, the money supply has increased. However like imaginary bank credit, they don't just hand it out as if it really were paper. The Government can't just ask for some money when they want it, they actually have to "borrow" it from the central bank, in exchange for Government bonds (Government debt). So in essence, Federal Reserve currency is "backed" by Government debt. This process of turning Government debt into money is called "debt monetization" and is actually very similar to how banks turn debt into money when they issue loans. The promise made by the debtor, along with a sufficient reserve, is all the bank needs to issue new money, they don't need to have all the money. The Federal Reserve doesn't need to have any reserves when they issue new money, in fact the Federal Reserve actually has no reserves of anything real like gold or silver. The Federal Reserve doesn't just loan money to the US Government, they loan out money to other private parties such as large banks. Even though some of the profits might go back to the treasury, that doesn't change the fact that the Government has to pay back everything it loans including interest on those loans, this extra money can only come from the Federal Reserve, it's an inescapable loop. Each FED Note represents a debt to the Federal Reserve, the entire economy is based off of debt owed to the Federal Reserve and large commercial banks. If that debt were to be paid back there would not be a single dollar left in circulation. "I wish it were possible to obtain a single amendment to our Constitution, taking from the federal government the power of borrowing." The problem here is not necessarily fiat money, but debt based money and the centralized ability of the private bankers to easily create and issue new money with little to no backing. Why doesn't the Government just issue/print its own money instead of paying fees to the central bank to get money which they have created out of thin air anyway? Good question... well it has been tried before actually. Lincoln created a currency called the "Greenback", we will spend a little bit of time looking at that currency and use it to highlight some important aspects of Bitcoin. There are several arguments against fiat currency which can be printed out of thin air, so lets start with that and then look at why they don't apply to Bitcoin. The following video presents the typical case against the FED and fiat money. They argue that fiat currencies such as the US dollar aren't backed by anything of real value, and can be created out of thin air at the whim of a central bank such as the Federal Reserve. 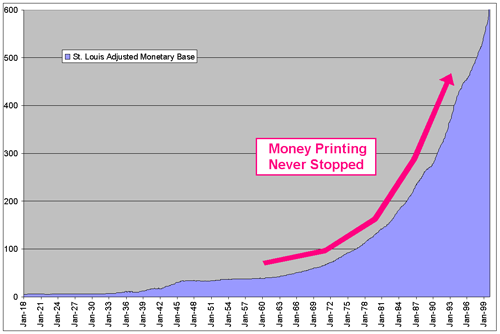 This process of continually printing more money leads to inflation and eats away at our savings. They even go so far as to say that Lincoln's Greenback was a disaster and led to a deep depression. Much of what they argue in the above video is of course true, inflation is a terrible problem caused by excessive money printing, carried out by the FED. However, there is a side to this story which you might not know about. The creators of that film seem to be so obsessed with their vendetta against fiat currency that they are missing the real reasons why fiat money is so often abused. If we can just move past our fiat stigma for one moment we will be able to see the real reasons why our fiat money system is so heavily compromised. Despite what that film may claim, in actuality, the Greenback currency issued by Lincoln was a tremendous success for many years, and led to a great industrial boom and a time of flourishing productivity in the United States. After the Civil War several economists argued "for building on the precedent of non-debt-based fiat money and making the greenback system permanent". However, there was strong resistance to this idea by bankers, and the greenback notes were called in, taken out of circulation, and replaced with a debt-based currency in 1913. With an eventual return to gold convertibility in mind, the Funding Act of April 12, 1866 was passed, authorizing McCulloch to retire $10 million of the Greenbacks within six months and up to $4 million per month thereafter. This he proceeded to do until only $356,000,000 were outstanding in February 1868. By this point, the wartime economic boom was over, the crop harvest was poor, and a panic in Great Britain caused a recession and a sharp drop in prices in the United States. The contraction of the money supply was blamed for the deflationary effects, and led debtors to successfully agitate for a halt to the notes' retirement. Eventually this contraction of the money supply and other artificially created problems led to the 'Panic of 1907', and as a result the Federal Reserve currency was established to ease the pressure and ensure future economic stability. By removing the Greenback notes from circulation so fast, they created a problem, and then they swooped in to solve the problem with their debt-based currency issued by private bankers. In fact, the Federal Reserve legislation was drafted by powerful elite bankers on a remote isle called Jekyll Island during a secret meeting. "The hard times which occurred after the Civil war could have been avoided if the Greenback legislation had continued as President Lincoln had intended. Instead there was a series of money panics - what we call rescessions' - which put pressure on Congress to enact legislation to place the banking system under a centralised control." If you are confused about what a Greenback note (aka United States Note) actually is, and how it differs from the typical Federal Reserve Note, the following snippet from Wikipedia should help fill in the gaps. It's important to understand the difference between these two forms of currency, and the history behind them. Now, in this snippet they try to claim the Federal Reserve Note isn't a fiat currency, and that it is "backed by debt"... that's true, as I just explained, but clearly this is not the type of 'sound money' backed by something of intrinsic value that people like Ron Paul speak about, and in fact it's much worse than a well controlled fiat currency. Even after reading that you may still be wondering what is the difference between a fiat currency such as the Greenback and a debt-based currency like the Federal Reserve Note. At the core they are both a type of currency which can be created extremely cheaply. Even though they claim the FED Note is backed by debt, the truth is debt has no intrinsic value, and the Government never really intends to pay back the debt it owes to the FED. The problem is that the Government doesn't need to go into debt just to create money, they could simply print their own notes like Lincoln did with the Greenback, and they wouldn't owe anyone anything in doing so. "The government should create, issue and circulate all the currency and credit needed to satisfy the spending power of the government and the buying power of consumers..... The privilege of creating and issuing money is not only the supreme prerogative of Government, but it is the Government's greatest creative opportunity. By the adoption of these principles, the long-felt want for a uniform medium will be satisfied. The taxpayers will be saved immense sums of interest, discounts and exchanges. The financing of all public enterprises, the maintenance of stable government and ordered progress, and the conduct of the Treasury will become matters of practical administration. The people can and will be furnished with a currency as safe as their own government. Money will cease to be the master and become the servant of humanity. Democracy will rise superior to the money power." Andrew Jackson also beleived the same thing, in fact he spent a great deal of effort attempting to remove the central bank, at which he temporaily suceeded. The simple fact is that we can't trust private corperations with the creation and issuance of our money. They create excessive amounts of money all the time and they hand it out to their partner banks and other special interests... and they have virtually no Government oversight. It's like one big secret money club. They continously undermine the economy and ruin the lives of millions of people in the process. Thus, we have the core reason why bitcoin issuance is done in a decentralized way. The divergence in the graph above pretty much corresponds to Executive Order 6102 when the Government made it illegal to own gold. Since that time the main form of currency in circulation has been the Federal Reserve Note, a debt-based currency. Now looking at that graph, we can see how the value of the dollar has dramatically dropped in comparison to the value of gold. This looks like pretty good evidence that the dollar should be backed by gold so that we don't get massive inflation like we are seeing in that graph. But the truth is not quite what it seems, take a look at the following graph. Once again, the problem has been artificially engineered by the FED. The devaluation of the dollar has actually been caused by printing too much money. In fact, since 1913 and the founding of the Fed, the dollar has lost around 95 percent of its value. The amazing thing about all of this, is that many so called economists will claim that this is "natural" for any growing economy, inflation is something we should promote, and deflation is something we should fear. They actually try to convince you that falling prices should be feared. The whole thing is utterly backwards. 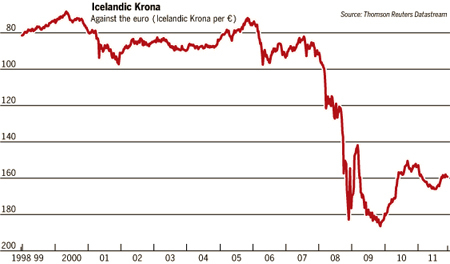 Anything in large amounts can be bad, too much inflation or too much deflation can be disastrous. But there is nothing wrong with simply allowing deflation to slowly happen. That should be the benefit of economic growth... you work harder and produce more then you reap the benefits of a stronger dollar. But what they do is continuously steal all that extra value through the deceptive act of debt monetization, which is effectively an attempt to extract wealth from the existing economy via inflation to cover Government spending, and as such is a sneaky method of taxing citizens and robbing value from their hard earned savings. "The bold effort the present [central] bank had made to control the government, the distress it had wantonly produced ... are but premonitions of the fate that awaits the American people should they be deluded into a perpetuation of this institution or the establishment of another like it." Some people may argue that a deflationary currency like Bitcoin will be horded and not spent. They argue people will save instead of spend. However, people save money for a reason, and that reason is so that they may spend it later. It should not be within anyone's power to enforce a crappy currency just so people don't want to save it. That idea sounds stupid and wrong doesn't it? So why then is it in the Governments power to enforce an inflationary currency? Does it not seem odd to you that the system is designed so your savings slowly whither away into nothing over time? We must realize that constantly printing new money in excessive quantities is unfair on several levels. Not only does the act of creating more money cause the rest of the money to become worth less, but the first people to get that money (which is often large banks) get to spend that money at it's full value before is has trickled down into the money supply and before it has been fully realized and recognized by the economy. The people lower down who attain that money at a later stage (often the average joe) don't get that full purchasing power because the economy has adjusted and taken into account that new money. The following video (2 hours long) will take you through the history of money. It provides a some what different perspective on the nature of fiat money and how it is manipulated. It explains why the Greenback was in fact a great success, and how the bankers were scared and determined to stop the Greenback, because it was a debt-free currency issued directly to the people with no interest attached. What you come to understand, is that it doesn't actually matter what backs a currency, but who controls the quantity. The historical evidence clearly shows fiat currencies work when properly controlled. "The underlying idea in the greenback philosophy... is that the issue of currency is a function of the Government, a sovereign right which ought not be delegated to corporations." You see, the bankers were very scared of this idea that the US Government could print its own money and issue it directly to the citizens interest free, because it took power away from them and put the power of real wealth into the hands of the citizens. If the quantity of the currency issued by the Government is handled properly, then continuous inflation is a problem that people don't need to worry about. Bankers on the other hand, don't know when to stop. In fact, a recent audit of the Federal Reserve uncovered new details about how it released $16 trillion in secret loans. You may still be wondering how the Greenback note relates to Bitcoin. In the same way that bitcoins don't represent a debt to anyone, a Government fiat currency like the Greenback also doesn't represent a debt to anyone. They are both a type of fiat currency not backed by anything, not even backed by debt. The only difference with Bitcoin is that the quantity is limited, where as the Government can always print more Greenbacks when they want to. The idea is though, that the Government is lot more accountable than semi-private entities like the FED which can issue secret loans and debase the dollar when ever they want. It would be harder for the Government to debase the dollar because of that accountability. One of the hard hitting examples provided in the The Secret of Oz, is that of the currency used by the Roman Republic. They created cheap coins made from copper and brass, based on the credit and trust of the nation. 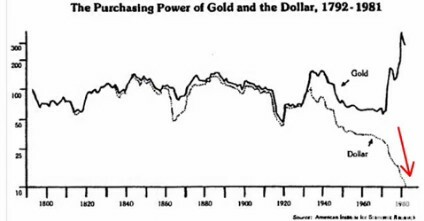 It was a fiat money - not backed by precious metals - and it was a great success. It is one of the main reasons that Rome was able to prosper for so long and become the great nation that it was. When the bankers forced Rome to revert back to a gold backed currency, productivity came to a sudden halt, a deep depression set in, and it quickly led to their downfall. There were probably several factors that caused their downfall. "Without the use of either gold or silver, Rome became mistress of the commerce of the world. Her people were the bravest, the most prosperous, the most happy, for they knew no grinding poverty. Her money was issued directly to the people, and was composed of a cheap material - copper and brass - based alone upon the faith and credit of the nation. With this abundant money supply she built her magnificent courts and temples. She distributed her lands among the people in small holdings, and wealth poured into the coffers of Rome..."
One of the main factors for their downfall might have been the sudden switch and withdrawal of the old fiat currency, in the same way that the contraction of the Greenback supply led to money panics. Another factor may have been that the bankers control vast amounts of gold. This is not to say that a gold backed currency is a bad thing, bitcoin is silimar to gold, being limited in quantity. And gold provides a sound backing with intrinsic value, and that's always better than something which can be easily created out of thin air. But just how can a Government afford huge gold reserves when they are deep in debt? Well they can't obviously. That's why they invented fiat money in the first place. Easy to create and you don't need a huge reserve of precious metals. But why does it work if it's not backed by anything real? Put rather simply... because everyone agrees the currency has value and they operate under the common understanding that they will always be able to trade with each other using that currency. That's why trust is very important for something like the US dollar. If everyone started freaking out and loosing faith in the dollar, the price could plummet to nothing overnight. It's the same thing for bitcoin. The system works as long as people have faith in the system. That's why it's important for a country to have a healthy economy, so that the world feels safe trading with that country and using or holding that countries currency. Because virtually all countries use fiat currencies now, so it's important the world has faith in your currency. Bitcoin is a fiat currency because it is not really backed by anything of intrinsic value. On one hand it is a fiat currency, but on the other hand it is a limited quantity digital commodity. However there's a key difference which we need to pay careful attention to: Bitcoins are hard to create and it takes a lot of electrical power to create them. You don't find that in any other fiat currency. Of course you cannot redeem your bitcoins for electrical power, which still means the entire system could implode if we all lost faith in it, and there wouldn't be anything real left at the end. It's also important to note that bitcoins are not based on debt and don't generate any usury/interest (a key point of this article). Did you know: the richest 400 people in America own slightly more wealth than the poorest 50% of Americans. Put simply, 400 people own more wealth than half a nation. So even though the use of bitcoins isn't enforced by the Government, people still want to use bitcoins. This is because bitcoins have qualities that make them desirable as a currency. They get their value from this demand. Much in the same way that gold gets its value from its desirability and usefulness. Bitcoin is the first type of decentralized digital currency to ever exist, they are immune to outside manipulation, the amount of bitcoins in circulation is completely predictable, and they are divisible by up to 8 decimal places. All these factors make bitcoins desirable and thus make them valuable, without needing to be backed by anything. So as we can see, it all comes down to how much of a currency is allowed to be put into circulation. The ultimate proof of this is the Bitcoin currency. The entire thing operates on a P2P network, there is no central bank which can control the issuance of bitcoins, and they are issued debt free directly to miners. New bitcoins are 'mined' by solving complex algorithms that help create the new bitcoins, but we need not get into too much detail. The important thing is that the total number of bitcoins that can ever be 'mined' is limited to 21 million. Just as the number of gold atoms on Earth are limited. Bitcoin is a limited quantity digital commodity, and also a deflationary fiat currency that can't be manipulated by bankers, and it will hold its value in much the same way as gold does. We don't need to trust that a central bank will print the right amount, because trust is placed in the cryptography on which the system operates. In this way, Bitcoin is almost the perfect type of currency. Everyone has a chance to mine bitcoins, no one owns them all, and the quantity is set in stone, free from manipulation by any group or individual who might wish to inflate the money supply by continuously creating more bitcoins when ever they desire. A few weeks after President Garfield made the above statement, he was assassinated. Many American Presidents have in fact been assassinated because they attempted to go against the will of the 'all mighty' bankers and their central bank. All this leads us to conclude that there is nothing wrong with fiat currencies like Bitcoin. The problem occurs when you create too much of said fiat currency and continuously devalue the rest of the currency by doing so. That shouldn't be allowed to happen, and the ability to do so certainly shouldn't be given to quasi-government entities such as the Federal Reserve. They never stop printing money. "The idea of creating a national bank I do not concur in, because it seems now decided that Congress has not that power (although I sincerely wish they had it exclusively), and because I think there is already a vast redundancy rather than a scarcity of paper medium." People like Ben Bernanke will do anything possible to downplay the massive scam that is inflation. It hurts more than just savings, it is the single greatest cause for rising prices. Things don't actually get more expensive unless the resources used to create that product are becoming more and more scarce, such as oil. Things are actually supposed to get cheaper and cheaper, because we get better at making them and our manufacturing techniques become more streamlined. That is exactly what has happened with computers and other electronic devices. But if you look at something like milk or bread or other foods and commodities, the prices always seem to be rising. With most of these types of products you will find that the manufacturing techniques have remained the same for a long time, so if anything those types of products should remain at relatively constant prices unless we lose some large crops or something - which doesn't really happen often. So even though the resources required for making those products do not become more scarce very often, and in fact are probably becoming more abundant, we still see a consistent rise in prices. The reason these products are always rising in price is quite simple: it's not that they are becoming worth more, it's that the dollar is becoming worth less, and it's doing so at an incredibly frightening pace. "The primary link between the stock market and the economy - in the aggregate - is that an increase in money and credit pushes up both GDP and the stock market simultaneously. Obviously, then, a growing economy consists of prices falling, not rising. No matter how many goods are produced, if the quantity of money remains constant, the only money that can be spent in an economy is the particular amount of money existing in it (and velocity, or the number of times each dollar is spent, could not change very much if the money supply remained unchanged)." When you hear on TV "sick of the rising prices? ", the way you should really interpret that is "sick of the falling dollar? ", because that's exactly what is happening. The real value of most commodities doesn't change very much, what actually changes is the price of those commodities relative to the purchasing power of the dollar. When the dollar becomes worth less, you need to pay more of it in order to supply the same amount of real value. Some people think a gold standard would work because gold holds its value very well, and the reason for this is that the amount of gold on Earth is limited. No one knows how to create more gold out of thin air, thus no one can make the rest of the gold worth less by making more of it. These are exactly the same principles that Bitcoin is founded upon. The money supply is limited for a very, very good reason. Namely, it is to ensure that the value of each bitcoin will hold their value well over time, because no one has the ability to continuously increase the money supply when ever they so wish. Bitcoin is not the type of currency where your savings will slowly whither away into nothing. Chances are that over time your BTC will actually go up in price.